In 1973, a French play called La Cage aux Folles took Paris by storm. The envelope-pushing production told the story of a gay couple that has to spend an evening masquerading as a straight couple (fortunately, one of them is a drag queen) to impress their son’s new fiancée’s ultra-conservative parents. It ran for almost 1,800 performances and spawned a 1978 film adaptation popular enough to justify two sequels. In 1983, Broadway legends Jerry Herman, Harvey Fierstein and Arthur Laurents collaborated on a musical adaptation that won Best Musical at the Tonys — it also won Best Revival of a Musical in 2004 and 2010. But you probably know it better as The Birdcage. The 1996 Mike Nichols film featured Robin Williams as the gay nightclub owner whose son is marrying the daughter of über-Republicans Gene Hackman and Dianne Wiest, while Nathan Lane played Williams’ effeminate drag queen partner. The Birdcage, however, is an adaptation of the French films, not the Broadway show, and features none of Herman and Fierstein’s award-winning songs, such as “I Am What I Am,” a proto-“Born This Way” gay anthem that became a club hit when Gloria Gaynor recorded it in 1983. In the current production, opening Oct 10 at the Royal Alexandra Theatre, Sieber plays the musical’s equivalent to the Nathan Lane character — effeminate Albin (aka drag superstar Zaza) — while notoriously tanned matinee idol George Hamilton plays the Robin Williams role — butch(er) club owner Georges. “I’ve been doing it now for a year,” Sieber says, “and I’m glad it’s the last eight weeks of our tour, because I don’t think I could do more! It takes a lot out of you.” Unusually, although Sieber did star in the recent Broadway revival, writer Fierstein played Albin/Zaza while Sieber tackled Georges. While Toronto is the only Canadian stop on this production’s tour, La Cage has been popping up all over the country recently. Separate productions of the musical played at Neptune Theatre in Halifax earlier this year and at the Vancouver Playhouse last winter, where it was one of the last shows to grace the historic theatre before it shut its doors for good. Alongside Sieber, Xtra asked Canadian actors Steven Gallagher and Greg Armstrong-Morris, who played Albin in Halifax and Vancouver, respectively, to share their thoughts on the musical and the iconic role all three have had the good fortune of playing. Xtra: La Cage is obviously a really enduring story. What do you think it is about it that people love so much? Christopher Sieber: The story is so great. It’s universal! It’s being true to yourself, being who you are. Steven Gallagher: Ultimately, the play is about family and the love parents have for their children. Greg Armstrong-Morris: We’ve been telling the same stories over and over since the Greeks. What keeps it interesting is finding fresh ways to tell those stories. At its core, La Cage is about a family in crisis and about the sacrifice a parent will make for his child’s happiness. Add drag queens and mistaken identity and bang — timeless! The story is from 1973, yet the concept of an ultra-conservative family stumbling into dinner with a drag queen still seems like a current, toothy joke. What about the show plays differently in 2012? Armstrong-Morris: The story is toothier now than ever. When it hit Broadway in 1983, the international queer community was rallying like never before in response to the AIDS epidemic. And today, there’s a mind-boggling rise in ultra-conservative politics. Drag queens and queer parents are certainly more visible in the broader media, but the fight for real equality — beyond mere tolerance — is hotter than ever. Gallagher: By the end of the show, the audience is rooting for Georges and Albin to succeed — a rare thing for the 1970s. These aren’t sad, lonely gay people; this is a normal couple who have a life and a family. And in 2012, we can now put a big, gay kiss at the end of the show, whereas I don’t think that happened in 1982. I was lucky enough to have George Pothitos as a director, who wanted the audience to understand that Georges and Albin are not asexual roommates, but two people in love. He staged the final kiss as the big, romantic moment of the show, centre stage, full light. In Halifax. And it got cheers every night! Albin/Zaza is an iconic queer role that’s been played by many performers. How do you make Albin yours? Armstrong-Morris: The original cast recording was the anthem of my joyously misspent youth! It was in my bones in its entirety. And YouTube has made it dangerously easy to watch what brilliant performers like Douglas Hodge can do. But once you’re in the rehearsal hall, those influences take a back seat to what you’re creating with your director and your cast mates. Gallagher: Albin’s such a gift to anyone lucky enough to play him. For me, the key to Albin is his absolute love of life. He may be a drama queen and scared of getting old and losing his husband, but underneath it all beats a fiercely loyal and protective heart. Sieber: The first part of your run is like the preview period. And you do big, broad brushstrokes and you try things out and you tell the story as best you can. And before you know it, it becomes part of you. It always becomes your own. But the other thing is that I worked with Harvey, who wrote it. I mean, I got to see how the writer wanted it done. And how invaluable, how great is that? The world has changed a lot since Albin first stepped on the scene. Can La Cage speak to today’s queer youth? Can Zaza grab the attention of the Gaga generation? Gallagher: Unfortunately, the world has not changed as much as we would like to think. Gay kids are still being bullied, gay men and women still have to fight for the right to get married, and gay people in non-urban centres still fear coming out. Albin represents every person who has managed to overcome society’s fear and ignorance to be loved for who he is. He still exists in every teenage boy who secretly dances to Madonna and has a crush on the quarterback. Armstrong-Morris: We had a busload of secondary school students come in to see the show from the BC interior. Their parents, of course, knew they were coming to Vancouver to see a show, but it wasn’t safe to tell the parents what show they were coming to see. So yes, I think “I Am What I Am” is as relevant as “Born This Way.” And ultimately, Gaga is singing about what Zaza sang before. Sieber: The generation that’s coming up — the younger generation — I have so much hope for. In our country, we have some very strange politicians who want to take away women’s rights and gay rights and a bunch of other stuff, and I’m hopeful because the younger generation just doesn’t care about all that weird stuff. So, I’m looking forward to seeing what they come up with when they get a little older, and I think our country’s going to be in a better place because of it. But like I said, it’s a universal story. You can identify with these people. You’re going to find someone up on that stage you can identify with. And if you like Gaga, you’ll love La Cage aux Folles. We’ve got drag queens! 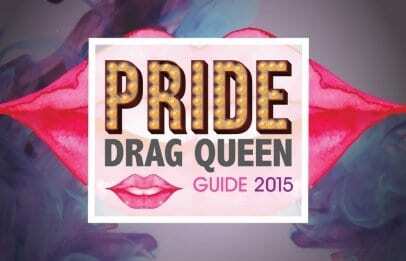 We’ve got eight drag queens in flowing dresses and high heels and wigs and big lashes. We’ve got it all!